Home > Blog > Living Rooms & Dens > Are You Ready To Get Rid of That Outdated Fireplace? Are You Ready To Get Rid of That Outdated Fireplace? In many homes, fireplaces tend to be the focal point of a room. So if the fireplace doesn’t look good, it can have a negative affect on an entire room. 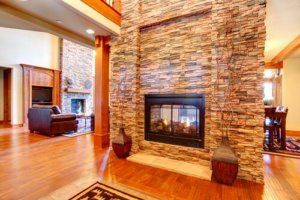 To make your fireplace is the star of the show, you should focus on two areas: the surround and the mantel. Refacing an old brick surround with new tile or stone is a simple way to transform your fireplace. In most cases, a new surround can be installed right over the brick. When choosing a new surround, keep your personal style in mind. For a modern look, choose large, smooth tiles, or even trendy, small glass tiles. If you are striving for a modern or contemporary fireplace with a sleek, simple look, stay away from showy or highly textured tiles. Or, for a formal room, consider using marble or granite tiles. If you like the current texture ,but not the color, of your fireplace, you can always paint the brick any color you choose. For a dramatic contrast with your walls, consider painting your fireplace a bright white or cream color. Or, to make the fireplace withdraw into the background, consider a neutral shade of beige for the surround. Painting is the easiest and quickest way to give your fireplace a new look. If you’re trying to exude a more modern look, you may want to remove the old mantel altogether. Conversely, mantels are key ingredients for a more traditional look. Wood mantels can warm up a room and offer a good space to display family keepsakes and artwork. If your mantel is too simple, try adding some decorative moldings to give it more interest. Staining the wood a darker tone or painting it are other options. The above ideas can be completed using natural gas or propane. A self-contained gas fireplace insert can be surprisingly realistic in its look and feel, plus it has an added benefit of being fast and easy to turn on and off. Find great design ideas and inspiration for your fireplace remodel or any other home remodeling projects at www.republicwestremodeling.com.